Objective: The practice of self-medication is growing world-wide. It is associated with problems that may lead to potentially life-threatening complications represent a priority to be investigated. The aim of this study was to estimate the prevalence of self-medication among undergraduate medical students and to evaluate the possible role of the pharmacist in self-medication in Kuwait. Methods: A descriptive cross-sectional study was performed, using the questionnaire on a sample of 900 male and female students randomly selected from three health faculties in Kuwait. The prevalence of self-medication, as well as the contribution of pharmacist in self-medication was assessed. In addition, the role of the pharmacist as drug consultant for the students after getting the medication was evaluated. Findings: The overall prevalence of self-medication was 97.8%. The age was significantly inversely proportional to self-medication. There was a significant difference between male and female students in self-medication practice. Headache was the highest health conditions that most frequently motivated self-medication with 90.1% prevalence, followed by 84.7% for dysmenorrhea and 60.3% for constipation. Contribution of the pharmacist as a part of self-medication care was low totally, with the highest rate for cough conditions 40.1%. However, the role of the pharmacist as a drug consultant was more noticeable after obtaining the drug, not before. Around 80.1% of the students request information from the pharmacist about doses, duration of treatments and side-effects. Conclusion: The prevalence of self-medication among undergraduate students in Kuwait is high and there were significant differences for age and gender. The contribution of the pharmacist was low in self-medication, while it was high after getting the drugs for obtaining drug related information. The practice of self-medication is alarming. Improved awareness about the role of pharmacist as a drug consultant for careful and cautious use of medicines available for self-medication would be strongly recommended. Self-medication has been reported as being on the rise internationally. It is defined as the use of medication by a patient on his own initiative or on the advice of a pharmacist or a lay person instead of consulting a medical practitioner. Data from the previous survey publications from different countries demonstrated an increased self-medication. The great availability of pharmaceutical products these days, ready access to drugs; quality of health-care, the increased potential to manage certain illnesses through self-care; economic, political and cultural factors have contributed to the growth of self-medication world-wide. Growing empowerment, resulting from improved educational levels and greater access to information, combined with increased individual interest in personal health, is resulting in growing demand for direct participation in health-care decisions. Self-medication is associated with many problems as incorrect self-diagnosis, inadequate treatment of a disease, which can result in disease progression and complications. Most drugs can have significant unwanted effects. This may result in serious clinical effects with potential life-threatening complications. Therefore, the diagnosis by the physician is very important for the proper treatment. The pharmacist in a community pharmacy has an important role in recommending drugs for self-medication. The pharmacist should distinguish between patients for whom pharmacists could recommend the drugs and patients who should be encouraged to consult physicians. World Health Organization 1998,  addressed that the pharmacist is an adviser to the public on everyday health-care and is a key figure in the supply and delivery of medicines to the consumer. He is a partner of the manufacturer of non-prescription medicines. The pharmacist in his professional capacity and in direct contact with patients is competent to provide sound advice on the medicines he supplies. Increasingly, people are managing a large proportion of their ailments without consulting either a doctor or pharmacist. Still pharmacists can play a key role in helping people to make informed self-care choices. The aim of this study was to estimate the prevalence of self-medication among healthy undergraduate students in Kuwait. Assess the frequency of self-medication for most commonly occurring medical conditions and investigate the possible role of the pharmacist in self-medication and as a drug consultant after getting drugs. The study population consisted of undergraduate students of health sciences professional education in Kuwait. Higher education is provided by Kuwait University, Faculty of Medicine and Faculty of Pharmacy and The Public Authority of Applied Education and Training Institute (PAAET), College of Health Sciences. A cross-sectional survey was conducted among 900 undergraduate medical students in Kuwait University and PAAET during 6 months in 2012/2013. This work was conducted in compliance with the requirements of the facility's Institutional Review Board/Human Subjects Research Committee. Pre-testing of the questionnaire was performed for contents, design, readability and comprehension on 15 students (five students for each faculty) and modifications were made as necessary so that the questionnaire was simple to answer, yet gave accurate data. The questionnaire was randomly distributed to the students and completed during a regular class period. The response rate was 91% since 81 students declined to take part in the survey. Questions were closed multiple choice type. The role of the pharmacist before and after getting the drug was evaluated. The questionnaire was composed of two sections; the first section consisted of 12 selected common health conditions, where the student was asked to choose between self-medication (family or pharmacist assisted) or visiting a doctor for treatment. The role of the pharmacist was evaluated as a part of the total self-medication. The second section was composed of five questions. The students were asked if they would seek the help of pharmacist after getting the drug. The questionnaire was prepared in accordance with guidelines approved by the Ethics Committee of Kuwait University. Data were entered into the Statistical Package for Social Sciences (SPSS version 20, Chicago, IL) and descriptive analysis was conducted. Prevalence of self-medication among undergraduate students was reported as a percentage and 95% confidence intervals (CIs). The CIs were computed using EpiCalc 2000 (Centers for Disease Control and Prevention, Atlanta, GA). As the main outcome measures were binary variables describing the self-medication status, logistic regression models were used to assess the predictors using SPSS version 20. Results were reported as odds ratio and 95% CI. Chi-squared tests were used to compare the prevalence of self-medication between PAAET and university students, as well as male and female student. P < 0.05 was considered to be significant. A total of 819 students were surveyed, 503 (61.4%) of whom were aged ≤ 20 years. 606 (74%) were females. 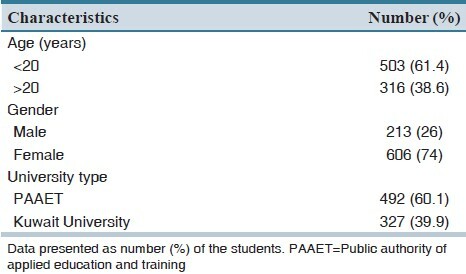 From all, 327 (39.9%) attended Kuwait University and 492 (60.1%) attended PAAET [Table 1]. The overall prevalence of self-medication among undergraduate students was found to be high, 98.8% among university students and 97.2% among PAAET students. The prevalence was the highest for headache (90.1%), followed by 84.7% for menstruation discomfort and 60.3% for constipation. Therefore students preferred to seek medical professionals for getting the proper treatment for the following conditions: Dermatologic conditions (86.1%), diarrhea (71.2%) and cough (66.5%) as shown in [Table 2]. For pain, 42.5% of students considered it as an alarming condition requiring a doctor visit and the remaining students (57.5%) practiced self-medication (9% requested pharmacist's advice and 48.5% considered the family as main sources for information). Although it was found that gender plays a significant role in self-medication for certain conditions. 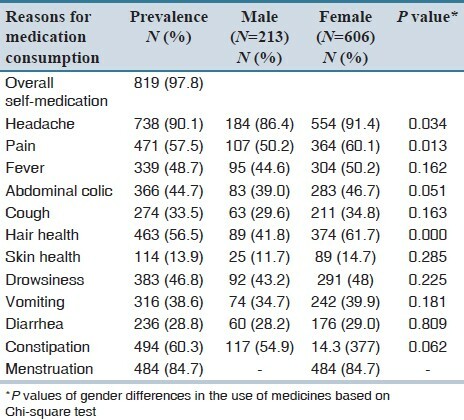 Female students used medications for pain, headache, abdominal colic reliefs, and hair products more commonly than male, as shown in [Table 2]. The differences among male and female for self-medication may be related to the most prevalent of these types of complications in female and not related to more attitude of female to self-medication. Headache, constipation, menstruation, pain and hair health have the highest occurrence percentage while skin health has the lowest occurrence among all the presented complaints. Moreover, age was significantly inversely proportional to self-medication, i.e. increase in age leads to decrease in self-medication practice. The contribution of the pharmacist (10.85 ± 2%) in helping students to choose a proper medication was significantly less than the family and friends, (35 ± 4%). 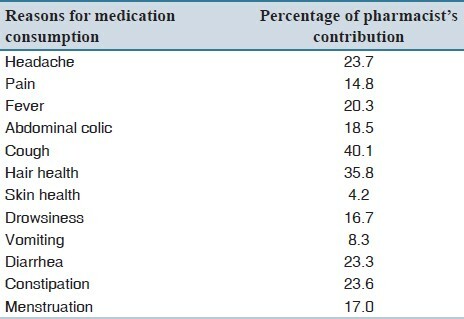 Suggesting cough products were the highest condition where the pharmacist has contributed most (40%), while the pain was the least (14.8%) as shown in [Table 3]. 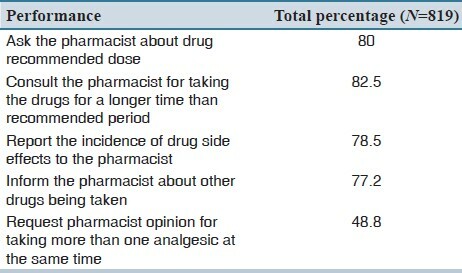 Attitudes toward the role of the pharmacist as a drug information consultant for drug dose, duration, side-effects, etc., are shown in [Table 4]. Our study showed that self-medication was highly prevalent among undergraduate medical students in Kuwait. A previous study for public schools in Kuwait showed that the prevalence of self-medication was high and tended to increase with age. Many studies in different countries also showed that the prevalence of self-medication in children and adolescent was high. [7-17] Although health services are free in Kuwait, the high prevalence of self-medication could be due to the high living standard and the availability of large varieties of drugs in the market. In the present study, self-medication decreased with age. This could be attributed to increased awareness of medical knowledge about drugs and their side-effects, as people grow older. Self-medication was more popular among female than male for certain conditions where pain killers were mostly required. The use of hair products by females was found to be more than male due to their interest in beauty. The role of the pharmacist has been changing over the past two decades. The pharmacist is no longer just a supplier of drugs and a distributor of medicinal products, but also a team member involved in the provision of health-care. The pharmacist can play a key role in helping people to make informed choices about self-medication and in providing and interpreting the information available. This requires a greater focus on illness management and health maintenance, rather than on product selling. The role of the pharmacist must be extended. Pharmacists can play a very important role in self-medication by providing patients with the necessary information about drugs and dosage, especially in the case of over-the-counter products. The pharmacist's role in patient care services should include counseling, building awareness about medical products, providing detailed information on the effects of these products on the human body, recommending dosages and doing follow-ups of patients for their ailments. There is an urgent need for pharmacists to boldly accept these challenges and hence that they can ensure that medicines are used appropriately even during the self-medication. In the present study, the role of pharmacist in helping students to make the proper choice of drug in self-medication was unexpectedly low, with an average of 10% ranging 6-21%. This indicates the minimal role of the pharmacist in an important issue in his special field. Although, around 80% of the students consulted pharmacists about the drug doses, side-effects, proper duration of treatment and concomitant usage of drugs. This indicates that the students believed that the role of pharmacist as a source of information is more important after and not before getting the drug. The attitude of undergraduate students towards self-medication was high. The major reason seems to be self-confidence, because of their skills and medical knowledge gained from their medical study. Although these information may not be enough at this level of study to judge and give decisions regarding medication. Important disadvantages of self-medication would be the risk of making a wrong diagnosis, inappropriate drug use and its adverse effects. Unfortunately, the presented results indicate that the understanding of students to the pharmacist's role as a health-care provider in Kuwait is minimal. Improved awareness for these issues in undergraduate students is critical for careful and cautious use of drugs. Therefore, this attitude should be considered, work out and resolve in Kuwait. At the same time, it is crucial to emphasize the role of the pharmacist as an important source for drug information. 1. Verma RK, Mohan L, Pandey M. Evaluation of self-medication among professional students in North India: Proper statutory drug control must be implemented. Asian J Pharm Clin Res 2010;3:60-4. 2. WHO guidelines for the regulatory assessment of medical products for use in self-medication, 2000. Available from: http://www.who.int/medicine/library/qsm/whoedm-qsm-2000-l/who-edm-qsm-00_l.htm. [Last accessed on 2012]. 3. Blenkinsopp A, Bradley C. Patients, society, and the increase in self medication. BMJ 1996;312:629-32. 4. Awad AI, Eltayeb IB. Self-medication practices with antibiotics and antimalarials among Sudanese undergraduate university students. Ann Pharmacother 2007;41:1249-55. 5. WHO Consultive Group. Report of the 4 th . The Role of the Pharmacist in Self-care and Self-medication, 1998. 6. Abahussain E, Matowe LK, Nicholls PJ. Self-reported medication use among adolescents in Kuwait. Med Princ Pract 2005;14:161-4. 7. Hardon AP. The use of modern pharmaceuticals in a Filipino village: Doctors′ prescription and self medication. Soc Sci Med 1987;25:277-92. 8. Chambers CT, Reid GJ, McGrath PJ, Finley GA. Self-administration of over-the-counter medication for pain among adolescents. Arch Pediatr Adolesc Med 1997;151:449-55. 9. Covington TR. Nonprescription drug therapy: issues and opportunities. Am J Pharm Educ 2006;70:137. 10. Geissler PW, Nokes K, Prince RJ, Odhiambo RA, Aagaard-Hansen J, Ouma JH. Children and medicines: Self-treatment of common illnesses among Luo schoolchildren in western Kenya. Soc Sci Med 2000;50:1771-83. 11. Hansen EH, Holstein BE, Due P, Currie CE. International survey of self-reported medicine use among adolescents. Ann Pharmacother 2003;37:361-6. 12. Awad AI, Eltayeb IB, Capps PA. Self-medication practices in Khartoum State, Sudan. Eur J Clin Pharmacol 2006;62:317-24. 13. Pereira FS, Bucaretchi F, Stephan C, Cordeiro R. Self-medication in children and adolescents. J Pediatr (Rio J) 2007;83:453-8. 14. Westerlund M, Brånstad JO, Westerlund T. Medicine-taking behaviour and drug-related problems in adolescents of a Swedish high school. Pharm World Sci 2008;30:243-50. 15. Du Y, Knopf H. Self-medication among children and adolescents in Germany: Results of the National Health Survey for Children and Adolescents (KiGGS). Br J Clin Pharmacol 2009;68:599-608. 16. Pfaffenbach G, Tourinho F, Bucaretchi F. Self-medication among children and adolescents. Curr Drug Saf 2010;5:324-8. 17. James H, Handu SS, Al Khaja KA, Otoom S, Sequeira RP. Evaluation of the knowledge, attitude and practice of self-medication among first-year medical students. Med Princ Pract 2006;15:270-5.